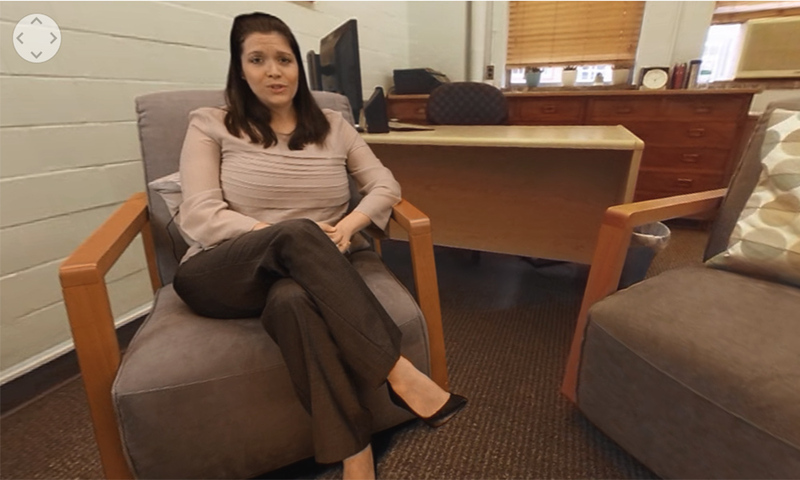 A still image from the virtual reality app features Lauren DeCaporale-Ryan, a clinical psychologist at URMC, in an office setting. As part of the app's modules, she teaches users about cognitive-behavioral therapy (CBT), a form of psychotherapy often used to treat conditions like anxiety or depression. A virtual reality app (VR) uses advanced display and immersive audio technologies to create an interactive, three-dimensional image or environment. An augmented reality app (AR), meanwhile, uses digital technology to overlay video and audio onto the physical world to provide information and embellish our experiences. What are new, innovative ways to increase community access to much-needed mental and behavioral health services? That’s the big question Michael Hasselberg’s department chair asked him to ponder. Hasselberg, an assistant professor of psychiatry and clinical nursing, is acutely aware of the high demand, regionally and nationally, for behavioral health services and specialists to treat conditions like depression, anxiety, substance abuse, and eating disorders. In this line of work, the gold standard treatment is cognitive-behavioral therapy. CBT is a form of psychotherapy that usually involves a therapist and patient working together to recognize and change the latter’s thinking patterns while also developing coping skills, according to the American Psychological Association. “It’s our first-line treatment for several of the diagnostic clusters we treat, specifically the depressive and anxiety disorders, and there’s a lot of evidence to show its effectiveness,” Hasselberg explains. Given that a majority of Americans today own a smartphone—77 percent, according to the Pew Research Center—a web or mobile app seems like an obvious answer. Indeed, such apps abound. “The idea of putting cognitive-behavioral therapy on a computerized app isn’t new,” Hasselberg says. Typically, such computerized cognitive-behavioral therapy (cCBT) features a voiceover with animation or perhaps a video of a therapist talking—but no meaningful interaction. Could a more immersive, customized experience, one harnessing today’s advances in virtual reality and augmented reality (VR/AR), help keep patients engaged with an app? Hasselberg pitched the idea a year ago during a meeting of the UR Health Lab, a multidisciplinary campus collaboration that leverages computing, analytics, and technology to solve challenges in medicine. Afterward, two faculty members approached him: Jiebo Luo, professor of computer science in the Hajim School of Engineering and Applied Sciences, and Matthew Brown, professor of music theory at the Eastman School of Music. Both were keen to bring their expertise to bear on such a project. Galvanized, Hasselberg tapped his colleague Wendi Cross, a clinical psychologist and associate professor in the Department of Psychiatry, to help develop evidence-based scripts and storyboards for a working prototype of the virtual reality app. Patients use their smartphones to access the app. They can see and hear the therapist, but can also look around the therapist’s room, which was filmed using a virtual reality camera. During a session, the therapist might assign the patient a task, such as completing a questionnaire about anxiety levels. The patient completes the in-app questionnaire. The answers dictate which video of the therapist plays next. Later, the therapist might suggest a mindfulness exercise in which the patient is asked to imagine being in a relaxing environment, such as a beach. The patient is then shown environmental photographs and asked to select a preference. Earlier in the module, the patient was able to identify personal preferences for calming music. The app’s algorithms then serve up the patient’s preferred 3D environment (a beach, complete with the sound of waves) and accompanying music. Meanwhile, the virtual therapist talks the patient through the mindfulness exercise. The next time the patient uses the app for an on-demand therapy session, the previous answers along with visual and aural preferences will be taken into account. Aesthetically pleasing and immersive video and music? Check. Built-in algorithms that deliver personalized content based on your needs and preferences? Check. With a working prototype in hand, the team’s next step is conducting usability testing to fine-tune the technology. If this intervention proves useful with patient populations, the big-picture goal is having the in-app data synch with a patient’s electronic health records. 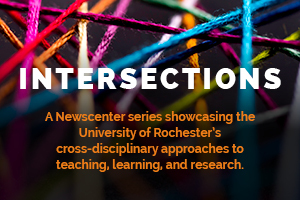 With funding from Arts, Sciences & Engineering and the Medical Center, “we formed a multidisciplinary team to create something that is otherwise not possible,” says Luo.